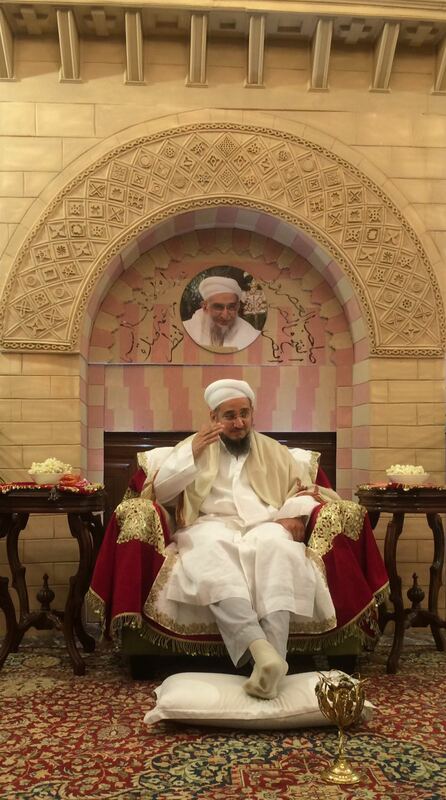 (Halqa Saifiyah is the name bestowed by Syedna Khuzaima Qutbuddin RA for all the halqas that take sabaq from Shehzadi Bazat-Saifiyah Baisaheba, daughter of Syedna Khuzaima Qutbuddin.) The following article is written by Sakina B., a student of Shzd Saifiyah Baisaheba. Maulana Fakhruddin arrived in the Iwan, and presided over the ziafat in front of a backdrop of a replica of the “Bab-ul-Futuh” (the “Door of Victories” from Fatimid Cairo), which had a photo of Qutbuddin Maula in the center, and the bayt “sahib al-asre waliyyy al-fathe wa al-nasri -nsuri / abdaka al-adna ilayhe rahmatan minka n-zuri”. A replica of a pillar from the al-Anwar masjid entrance was a backdrop for the seating for Busab and Aaisab. The ziafat program commenced with Tilawat-ul-Quran by a talib Husein Arsiwala (trained by Shehzadi Bazat Tayyebah Baisaheba). This was followed by a recitation of a madehwritten in sanaa’ and shukr of Syedna Taher Fakhruddin by Shehzadi Bazat Saifiyah Baisaheba, recited by all the talabat in conjunction. 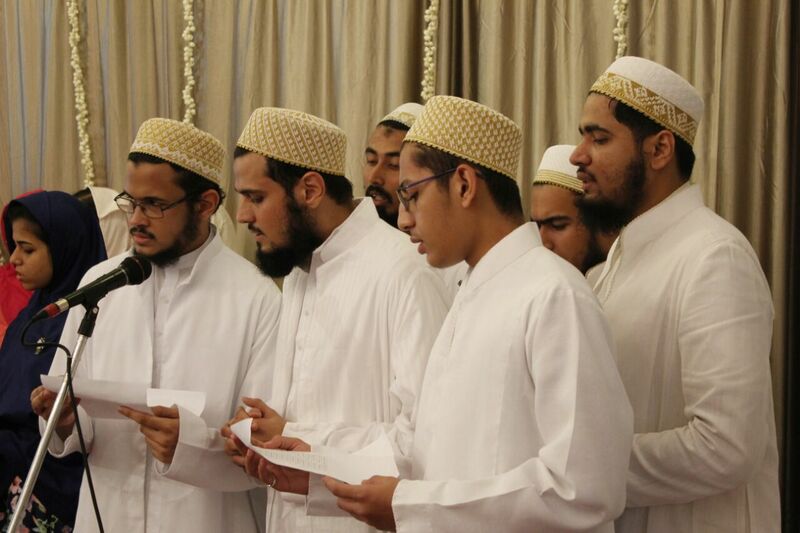 Then the talabat talebaat all presented individual shukr speeches, madehs and poems they had written themselves. After this was the rasam of sharbat and wadhawanu, and najwa. Shz Bazat Saifiyah Baisaheba then did shukr araz in Hazrat Imamiyah Nooraniyah: she spoke of the bayaan delivered in Ashara waaz by Fakhruddin Maula that ‘the throne of the Haqq ni Dawat is on Water’, meaning that the foundation, identity and perpetuation of the true Dawat is ‘ilm, and expressed unending gratitude for the nazaraat of Qutbuddin Maula, and the azeem and unforgettable ne’mats, including the ne’mat of Aal-e-Mohammad ‘ilm, bestowed by him and his waaris Fakhruddin Maula, and did arazfor doa for talaqqi and khidmat of ‘ilm. Maulana Fakhruddin then addressed the talabat with kalemaat nooraniyah. 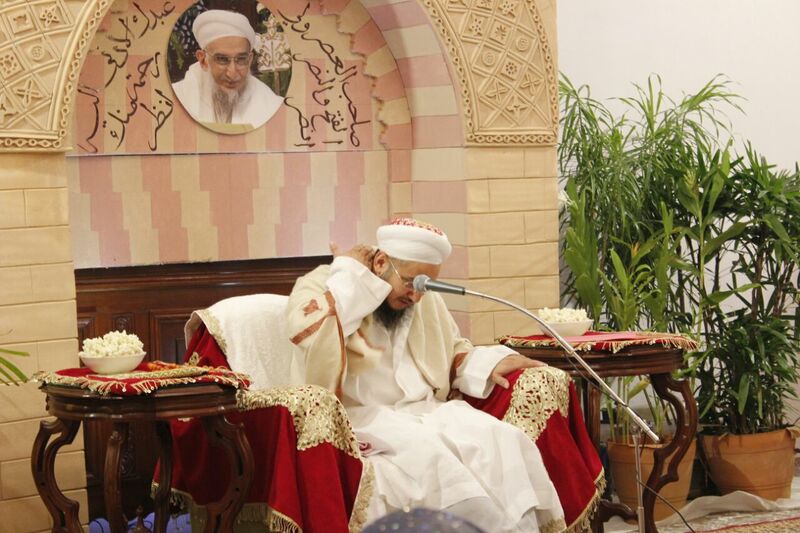 He spoke of the importance, value and necessity of ‘ilm, reciting aayats from the Qur’an and quoting abyaat. He said that this 'Ilm ni rozi” is a ne'mat which gives security here and in the Hereafter. 'Ilm and learning should be the paramount focus and priority. He remembered Qutbuddin Maula, to whom we owe the greatest ne’mat, iman; he was aalim e aale mohammad, our mufeed, who inspired and ignited minds towards 'Ilm; he was a noor na sahib, those who associated with him became noorani. He honored the talabat by saying that Qutbuddin Maula must be very happy in Jannaatun Naeem seeing their mohabbat, walwala, ikhlaas and marefat, and also that "Mamluke aale Mohammad na dil par ghani masarrat chhe." He gave maw’ezat to the talabat to always do shukr for the ne’mat of 'ilm they have received, and to learn ‘ilm with dedication and to do khidmat, bestowing doa mubarak that Allah give them yaari and tawfeeq to fill their souls to the brim with ‘ilm and to put this knowledge into actions, and also one day participate in the most afzal hasanatof nashar of ‘ilm. He expressed khushi for Bazat Saifiyah Baisaheba’s khidmat, saying, “she prepares you to do khidmat and I see all of you here, day and night do khidmat; someone said to me that this is now our home, I replied that you are my children so of course it will be your home.” The bayaan ended with shahadat of Imam Husain and doa. 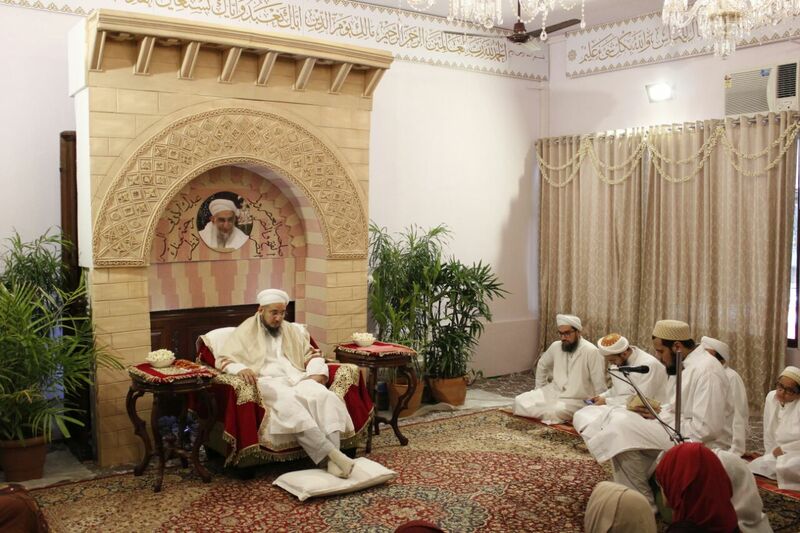 Then all talabat talebaat received sharaf of qadambosi. After zohor asar namaaz, Maulana Fakhruddin came for the ziafat thaal: the main course was a fondue, accompanied by salads, soup and risotto, and desserts.